The jugular veins are a part of human circulatory system which drains the blood from the head into the lungs. The internal jugular vein drains most of the cerebral veins and outer part of the face and is connected to the right atrium without the presence of any interfering valve, this behaving as a tube for the blood. The external jugular vein drains most of the outer structure of the head and deep parts of the face into subclavian vein. The internal jugular vein joins with the subclavian vein to form the brachiocephalic veins, which ultimately form the superior vena cava and drains into the heart. A smaller jugular vein, known as anterior vein comes from the front to join the external jugular before it connects to the interior jugular. 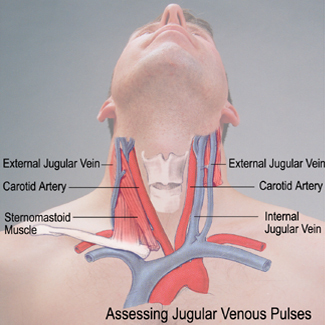 What is jugular venous pulse? 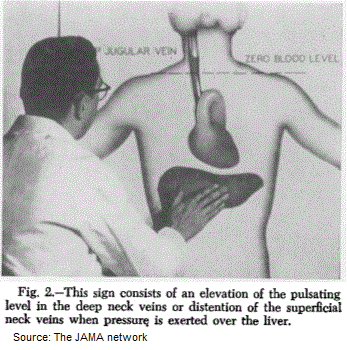 Jugular Venous Pulse (JVP) provides an indirect measure of central venous pressure. JVP is defined as the pressure changes transmitted in form of waves from right atrium to veins which are present near heart. Another commonly used definition is the indirectly observed pressure over the venous system by visualizing the internal jugular vein. It reflects right atrial pressure and the relationship between right atrial filling and emptying in right ventricle. However, the detection of JVP or any of the abnormalities can be difficult. Which vein is used for measuring JVP? The internal jugular vein is preferred over the external jugular vein for measuring jugular venous pressure. The reason behind this is that the external jugular vein is very superficial, so it is prone to local changes of pressure. The internal jugular vein is deeper and hence avoids any such change of pressure due to a local manifestation. Another reason for this preference is that the external jugular vein has a sphincteric connection with the superior vena cava. So the pressure of right atrium and superior vena cava cannot be truly represented by the external jugular vein. The internal jugular vein does not have any sphincter at its connection with the superior vena cava hence it can represent the pressure as well as the pressure differences of the right atrium and superior vena cava. The right sided internal jugular vein is preferred over the left side as it is more in line with the heart. The normal mean jugular venous pressure is determined as the vertical distance above the midpoint of the right atrium is 6 to 8 cm H2O. The normal jugular venous pulse consists of three positive waves and two negative waves. Positive waves are ‘a’; atrial contraction, ‘c’ closure of tricuspid valve and ‘v’ is for atrial filling. Negative waves are x descent which is for the downward movement of right ventricle and y descent which is the early right ventricular filling stage. The positive waves occur before the carotid upstroke and immediately after P wave of the ECG, simultaneous with the upstroke of the carotid pulse and during ventricular systole till the tricuspid valve opens. Patient should be in a recline position with head elevated at 45°. Add 5 cm to the measurement because the right atrium is 5 cm below the sternal angle. Light should be tangential to lighten up the highlights and shadows. Neck should not be sharply flexed. Locate the surface markings of internal jugular vein which runs from the medial end of the clavicle to the ear lobe under the medial aspect of sternocleidomastoid. Trace the jugular venous pressure and find the double waveform pulsation. Using a centimeter ruler, measure the vertical distance between the angle of Louis (manubrio sterna joint) and the greatest level of jugular vein pulsation. A straight edge intersecting the ruler at a right angle can be helpful. The cardiac examination however is a time consuming process and should not be performed in hurry as it will cause physical discomfort to the patient. The source of light used in this procedure can be a flashlight or bedside lamp. To determine the mean jugular pressure the examiner should look for the lowest point of the venous column on inspiration followed by the crest of the venous column on expiration during breathing. Next, the midpoint of the venous pulse during normal respiratory cycle is observed n estimated visually. Excessive breathing usually disrupt the normal mean venous pressure value, thus this condition should be avoided. Normally, the mean venous pressure declines during inspiration. At last, the examiner applies pressure over the liver for about 10 seconds while observing the mean venous pressure. Normally, there is no or a slight rise (about 3 – 4 seconds) rise in mean jugular venous pressure. Where there is a sustained increase in the mean JVP until the pressure applied is released, this indicates impaired right heart function. This abnormal response is called hepatojugular reflux. Distention of neck veins is visible when persistent firm pressure is applied on to the liver. Checking for the hepatojugular reflux has been a reliable method in congestive heart failure. When the heart is functioning properly, the pressure on the liver does not cause a rise in venous blood level. This is because the heart promptly increases its output, in response to an increase in venous return thus preventing a rise in jugular venous pressure. The impaired heart is unable to respond to the increased venous return leading to a rise in venous pressure. The disappearance of heaptojugular reflux provides an end point of optimal or maximum therapeutic effect. Multiphasic – there are two waves in JVP for each contraction-relaxation cycle by the heart. The carotid artery only has one beat in cardiac cycle. Non-palpable – the JVP does not palpate. The pulse which normally felt in the neck, it is due to the common carotid artery. Occludable – the JVP can be stopped by occluding the internal jugular vein by lightly pressing against the neck. Varies with head-up-tilt (HUT) – the JVP changes with a change in the angle of neck. When the person is in standing position, his JVP appears to lower on the neck. Whereas the carotid pulse does not vary. Varies with respiration – the JVP decreases with deep inspiration. Hepatojugular Reflux – JVP can be enhanced when abdominal pressure is applied where no distention of carotid artery is seen. What does jugular vein distention mean? Any condition which can increase blood volume, or interferes with right atrial filling or the movement of the blood from the right atrium into the right ventricle has the potential to increase central venous pressure and hence cause jugular vein distension. When there is right ventricular hypertrophy (e.g. in pulmonary hypertension, pulmonary stenosis or tetralogy of fallot), the atrium needs to build up more pressure to force the blood into the non-compliant and stiff ventricle. This increase in pressure causes the ‘a’ wave to rise. This is called prominent a waves. When the right atrium contracts against a closed tricuspid valve, the pressure within the right atrium increases by manifold as the blood is not going forward. This will cause a very high a wave. This commonly occurs in complete heart block. In tricuspid regurgitation, there is backflow of blood from the right ventricle into the right atrium and inferior vena cava. In such a case the v wave (which represents blood entering into right atrium and is normally due to the venous return) joins the x descent (which represents atrial relaxation). This is called ventriculization of the venous pulse. In constrictive pericarditis, there is a rapid x descent clinically manifested as an abrupt collapse of the neck veins. 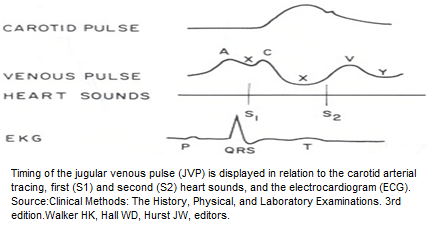 The JVP may be raised with a normal waveform, or an abnormal waveform, or may be with absent pulses. Below is the list of differential diagnosis that you must think about in each specific situation. What is kassamaul sign? Clinical condition associated with it? On inspiration, the lungs inflate and hence the pulmonary vasculature resistance drops. As a result the output from the right side of heart increases. To accommodate there is increased output, the venous return to the right side of the heart also increases. As a result on inspiration there is normally a decrease in jugular venous pressure. However in constrictive pericarditis, against expectation, there is a rise of jugular venous pressure during inspiration. The pathophysiology behind this is that in constrictive pericarditis, there is a reduced heart filling. As a result there is pooling of the blood behind the right heart, particularly the liver is congested. On inspiration, the diaphragm is pushed downwards and it then pushes the congested liver. This squeezes out the blood and forces it towards the heart. However the main problem of the inability of the heart to stretch and refill itself completely still persists, as a result, instead of blood entering the heart, it pools behind the heart. This pooling will cause distension of the neck veins, which is more profound on inspiration. Bulging neck veins with cough and hoarse voice: common cold, bronchitis, laryngitis, GERD, CHF, lung cancer, sjogern’s syndrome, esophageal cancer, allergic reaction, hay fever, acute sinusitis, asthma, pneumonia, coup, cystic fibrosis, COPD, tuberculosis, pleural effusion, sarcoidosis, asbestosis, whooping cough, foreign object inhalation. Bulging neck veins with bleeding, bruising and choking: bruise or contusion, hematoma, trauma or injury, CHF, muscle strain, swallowed object, thrombocytopenia. Bulging neck veins with lump: CHF, hyperthyroidism, abscess, benign lipoma, epidermal cyst, swollen glands, thyroid cancer, thyroid nodules, throat cancer. Bulging neck veins with visible pulsations: CHF and aortic regurgitation. Bulging neck veins with ear ache, guarding, joint pain: dislocated shoulder, ear canal infection, rotator cuff injury, impingement syndrome, tendinitis, muscle strain, repetitive motion injuries, earwax blockage, middle ear infection, chronic sinusitis, sub-deltoid bursitis, swimmer’s ear, ruptured eardrum, pseudogout, respiratory syncytial virus, rheumatoid arthritis, foreign object in the ear canal, frozen shoulder, gout, aortic stenosis, bone spurs, psoriatic arthritis, brachial plexus nerve injury, polymyalgia rheumatica, ulcerative colitis, cervical neck spinal stenosis, lupus, multiple sclerosis, thyroid cancer separated shoulder, septic arthritis, crohns disease, shingles. Bulging neck veins with headache and disorientation: CHF, medication reaction, brain aneurysm, aspirin poisoning, vasovagal syncope, alcohol withdrawal, sleep apnea, generalized anxiety disorder, heart rhythm disorder, heat stroke, supraventricular tachycardia, hyperventilation, hypoglycemia, kidney failure, anemia, atrial flutter, hyper or hypotension, stroke, diabetic ketoacidosis, hyperthyroidism, concussion, drug abuse, toxic shock syndrome, mad cow disease, cat scratch disease, shock.